Biography of English Neoclassical Sculptor, Jasperware Designer. Designer, draughtsman, and one of the leading neoclassical sculptors in England, Flaxman is known for his sculptures, drawings, engravings and designs for Wedgwood pottery. A prodigy in the art of sculpture, he was taken up by the great Italian neoclassicist Antonio Canova (1757-1822) who helped him to win the important commission for the Fury of Athamas (1792). This statue is a less dynamic reworking of Canova's own Hercules and Lichas (finished 1796) but despite this, it was greatly admired by his contemporaries. Returning to England, Flaxman benefited from the boom in the demand for heroic monuments to officers killed in the Napoleonic Wars, and his solid style of Neoclassical sculpture won him international fame during the period. His most famous works include monuments to Vice-Admiral Horatio Nelson (1808) and Sir Joshua Reynolds (1807), both found at St Paul's Cathedral. For a guide: Neoclassical artists. Born in York, Flaxman's family moved to London when he was nine. Largely self-educated, he enjoyed drawing and modelling. Through his father's position as a seller of moulds and plaster casts he came into contact with society and other artists, in particular becoming best friends with the artists and engravers William Blake and Thomas Stothard. At the age of 12, working in pencil and clay, Flaxman won first prize from the Society of Arts for a medallion he created. He exhibited regularly at the Gallery of the Free Society of Artists and in 1770 entered the Royal Academy of Art. Flaxman studied and exhibited at the Academy for the next few years, making an attempt at painting but finding more interest in sculpture. Surviving works from this period include a wax model of Neptune (1770); 4 wax portrait models (1771); a terracotta bust, a wax figure of a child, a historical figure (1772); a figure of Comedy; and a relief of a Vestal (1773). At the age of 19 Flaxman entered employment with Josiah Wedgwood. Wedgwood perfected Jasperware in 1775, a kind of hard, slightly translucent stoneware that could be decorated by colouring the ground. Traditionally the ground was only made in white, but Wedgwood coloured it 'Wedgwood' blue, lavender, cobalt and pale green. Wedgwood's name became synonymous with Jasperware, his international reputation soared as people flocked to buy his pottery in the shapes of Greek vases. Flaxman began designing a large body of these works, including cylindrical vases in the forms of ancient Rome. A fine example exists in the Metropolitan Museum of Art, New York - coloured in blue and decorated in white relief. Flaxman's work with Wedgwood strengthened his education in Greek art and Greek pottery, and confirmed his interest in line. He stayed designing and etching for Wedgwood for seven years. At the same time, he gradually built up his practice as an illustrator and sculptor. Engravings Flaxman made to accompany texts of Homer, Aeschylus and Dante (1802) showed exceptional purity of line and helped gain him international fame, and led him to be described by Goethe as "the idol of all dilettanti". To learn how to judge artists like the Neoclassical English sculptor John Flaxman, see: How to Appreciate Sculpture. For later works, please see: How to Appreciate Modern Sculpture. 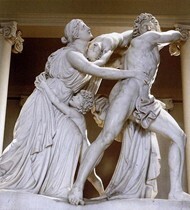 From the mid 1790s Flaxman threw himself into sculpture. A fine example of relief sculpture was his marble monument to Agnes Cromwell (1797) at Chichester Cathedral (located in the third side chapel off the south aisle). This is an elegant work that combines both high and low relief. It shows Agnes, who died at 18, being whisked upwards by three angels. He also created a monument to the poet William Collins (Chichester Cathedral, 1795) and one to Earl Mansfield (Westminster Abbey, 1795-1801). He also produced a statue of Vice-Admiral Horatio Nelson (1808, St Pauls Cathedral): decorated in honours, the admiral stands on a round pedestal surrounded with naked reliefs of Sea Gods. Although he was appreciated as a designer, large scale sculptures were not considered Flaxman's strength - he tended to mix contemporary styles with classicism, confusing and combining the different elements. The Mansfield Monument (1795) is a case in point. The structure of the freestanding monument, consisting of the Earl of Mansfield supported by Justice and Wisdom, is taken from papal tombs by Bernini, but the naturalistic portrayal of Mansfield clashes unhappily with the insipid allegorical figures and other elements of neoclassical art. In 1797 Flaxman was made an associate of the Royal Academy, in 1800 he was elected full Academician and in 1810 he was appointed first professor of Sculpture. He continued to receive commissions including monuments to Mrs Baring (1805-11, Micheldever church); Sir Joshua Reynolds (1807, St Pauls Cathedral); Captain Webbe (1810); Captains Walker and Beckett (1811); Lord Cornwallis (1812); and Sir John Moore (1813). Flaxman died in 1826. There is a Flaxman gallery at University College London which holds a large collection of his works. His compositions can best be studied in the casts from his studio sketches which are housed at the gallery. Other principal works can be found in most of the best art museums in Britain, including the British Museum, the Tate and the Victoria and Albert Museum. Examples of drawings by Flaxman at the Tate, include: Design for a Monument to Alderman Beckford (1770); Waiting on Sir Edward Hales at St Stephens (1775, Caricature); Alcestis and Admetus (1789); Classical Figure Studies (1792); and images from The Odyssey of Homer, Council of Jupiter, Minerva, and Mercury (1805).  For more about neoclassicism in sculpture, see: Homepage.